In Japan, there is an anime called Love Live! It’s about schoolgirl idols. It’s more than just popular. Way more. 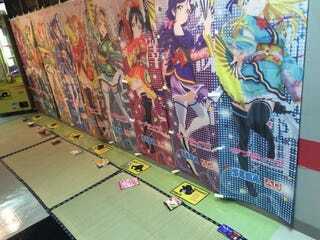 As Twitter user S1Amk shows, a Sega arcade in Osaka Prefecture set up a special area where Love Live! fans can prostrate themselves (bow completely down in what’s called “dogeza” or 土下座 in Japanese) before the characters and make offerings. On Twitter, some noted that this was also a way for the arcade employees to get free snacks and cakes. Hey, somebody has to eat those offerings!